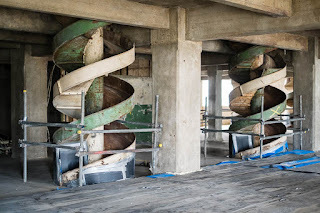 The Millennium Mills building have been at the heart of Silvertown as London's largest flour milling centre since Victorian times, until it fell into disrepair in the 1980s. It's about to take centre stage yet again by being the centre piece in the planned Silvertown regeneration, as the new creative hub of London. I got invited along to see inside before the redevelopment kicks off. The Mills have come along way to even get to where they are today - looking at their history I am tempted to say "you can't kill the mills". The early mills were built in 1905 equiped with state of the art technology producing the finest flour from the "best wheats of the world." Spillers milling company took them over in 1920 when demand was growing for the beautiful white bread sandwiches especially among those in the mining districts. Disaster struck in 1917 when a massive explosion in the nearby munitions factory, that was manufacturing explosives for the military during WW1, either destroyed or severely damaged everything within the surrounding 17 acres. It is purported that it even blew out the windows in the Ritz Hotel several miles away. Rebuilt in art deco style in 1933 the building again stood grandly on the banks of the Thames until WW2, when it was again severely damaged. This time by German bombs. Post war the building was reconstructed and in 1953 rose to glory yet again. Over 100,000 workers were employed in the Silvertown and surrounding Docklands area during this period. Containerisation and air cargo had a devastating impact on industry in Docklands, and by the 1980's the area was empty and remained largely abandoned until the regeneration projects of the 21st century started, creating the new Docklands. Even in the early days those who worked or lived here were creative and innovative (yes innovation existed before the 21st century). During Spillers time they not only milled flour but they famously began producing "Winalot" dog biscuits in 1927, targeting the greyhound racing market. (They now specialise in pet food). They were creative orally as well, the term "toe-rag" originated in Silvertown with grain workers known as toe-raggers due to their habit of tying their trousers to prevent the grain getting inside. 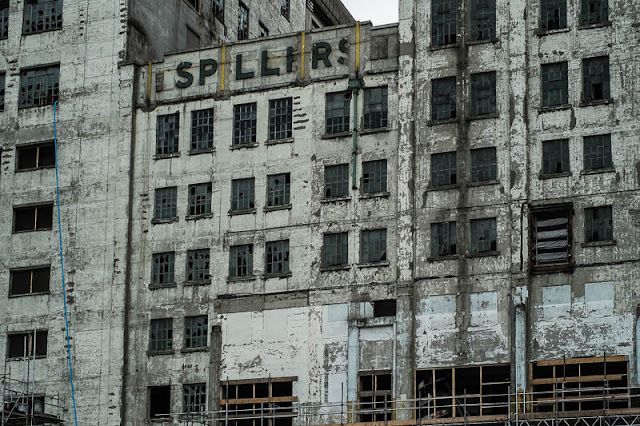 During the derelict years Millenium Mills was a backdrop in movies, The Last of England, Brazil and Green Zone, in television, Ashes to Ashes, and Splinter Cell, and music videos by Coldplay, Arctic Monkeys and Orbital all used the Mills as part of their creations. 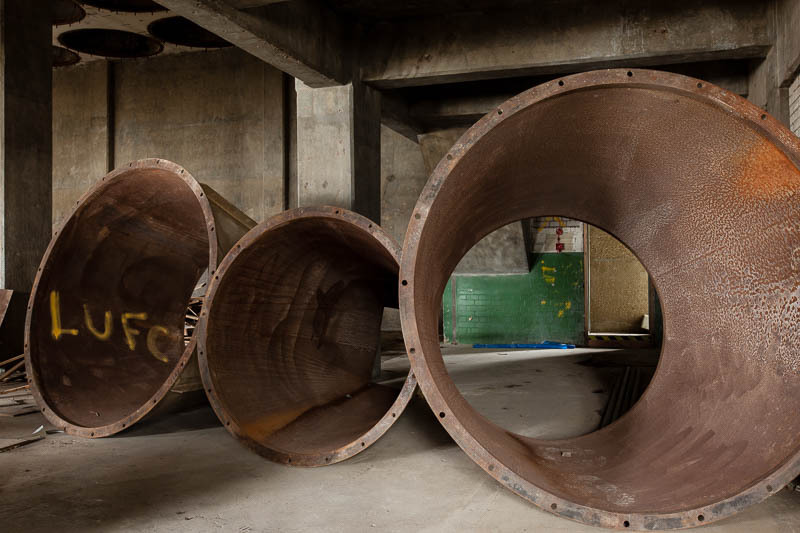 During the London Olympics the area opened as London's Pleasure Gardens, a place for hosting music and art events. 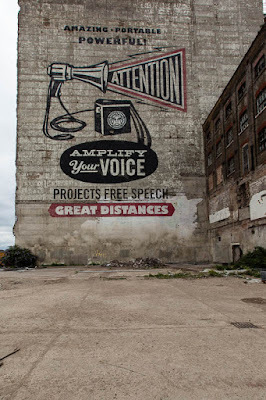 A last remnant of this time being the "ghost ad" by one of America's most famous street artists Shepard Fairey. So what's next for the un-killable Mills? Well, in April this year the Newham Council granted permission for a new £3.5 billion redevelopment project, injecting £12 million start up money to aid in the first step of removing asbestos from the building. This new ambitious project aims to spend the next 10 years transforming the area into a mixed development of "commercial and brand spaces, homes, leisure, culture, new parks and gardens." They promise affordable "brand hubs" more than 20,000 jobs and 3,000 new homes. In essence then the laudable aim of breathing creative and innovative life once more to Silvertown. aglimpseoflondon will keep you posted. The three thousand homes will be unaffordable for most and will end up in the hands of Russians and Chinese. It will be good to see this once done up. I think it is great. I just read an article about all the changes that this project might bring. Fascinating; yes - watch this space. Or your space, rather. I thought I recognised the place, it's been a hit with the Urbex guys for years and plenty of photos from the place are about. At least it is being redeveloped rather than demolished. A very ambitious project to say the least! Do you suppose after 10 years it will look a lot like Canary Wharf? It does sound un-killable, having been resurrected a fewl times before. 3.5 billion pounds ought to transform it into something spectacular! It'll need a lot of work, but it seems worth doing. I am jealous. You get invited to all of the cool places. 3.5 BILLION pounds??? That is more than even I have? Oh lucky you, that's stirred some childhood memories. I remember the dock being full of ships..
Oh! You did see some interesting parts of the Mills on your first visit. I love those funnels!